Abstract: The nucleotide-binding oligomerization domain (NOD) protein, NOD2, belonging to the intracellular NOD-like receptor family, detects conserved motifs in bacterial peptidoglycan and promotes their clearance through activation of a proinflammatory transcriptional program and other innate immune pathways, including autophagy and endoplasmic reticulum stress. An inactive form due to mutations or a constitutive high expression of NOD2 is associated with several inflammatory diseases, suggesting that balanced NOD2 signaling is critical for the maintenance of immune homeostasis. In this review, we discuss recent developments about the pathway and mechanisms of regulation of NOD2 and illustrate the principal functions of the gene, with particular emphasis on its central role in maintaining the equilibrium between intestinal microbiota and host immune responses to control inflammation. Furthermore, we survey recent studies illustrating the role of NOD2 in several inflammatory diseases, in particular, inflammatory bowel disease, of which it is the main susceptibility gene. The human body is constantly in contact with a myriad of microorganisms, either pathogens or commensals. Innate immune system, which provides a first line of defense against many common microbes, is essential for an appropriate tissue homoeostasis as well as for common bacterial infections, and its dysfunction leads to infectious, inflammatory and autoimmune diseases. Innate immune response relies on recognition of evolutionarily conserved structures on the microorganisms, termed pathogen-associated molecular patterns (PAMPs), through a limited number of germ line-encoded pattern recognition receptors (PRRs) present on the host cell surface or in the intracellular compartments.1 Among the latter, nucleotide-binding and oligomerization domain containing protein 2 (NOD2) is a cytosolic receptor belonging to the nucleotide-binding oligomerization (NOD)-like receptor (NLR) family.2 NOD2 is able to detect intracellular muramyl dipeptide (MDP), a component of the bacterial wall that is ubiquitously present in bacterial peptidoglycan.3 Upon activation by ligand, NOD2 mediates innate immune response triggering proinflammatory responses. NOD2 mutation or altered expression has been found in patients with chronic inflammatory disorders such as Crohn’s disease (CD), Blau syndrome (BS) and early-onset sarcoidosis (EOS).4–9 In this review, we summarize the current knowledge about NOD2 functions and regulation, as well as its involvement in chronic inflammatory diseases. Figure 1 Structure of the NLR subfamilies. Abbreviations: AD, atopic dermatitis; BIR, baculovirus inhibitor repeat; CARD, caspase recruitment domain; CIITA, class II major histocompatibility complex transactivator; FIIND, function to find domain; LRR, leucine-rich repeat; NAD, NBD-associated domain; NBD, nucleotide-binding domain; NLR, NOD-like receptor; NLRA, acidic transactivation domain; NLRB, baculovirus inhibitor repeat; NLRC, caspase recruitment domain; NLRP, NLR family pyrin domain; NOD, nucleotide-binding oligomerization domain; PYD, pyrin domain; X, unknown effector domain. Figure 2 Signaling pathways triggered by NOD2. Abbreviations: AP-1, activator protein-1; ATF6, activating transcription factor 6; ATG, autophagy-related genes; ATG16L1, autophagy related 16 like 1; ER, endoplasmic reticulum; ERK, extracellular signal-regulated kinase; IFNs, interferons; IKB, NF-κB inhibitor; IKK, IκB kinase; IRF3, interferon response factor 3; JNK, c-Jun N-terminal kinase; MAVS, mitochondrial antiviral signaling; MDP, muramyl dipeptide; NEMO, NF-κB essential modulator; NOD, nucleotide-binding oligomerization domain; PERK, protein kinase RNA-like endoplasmic reticulum kinase; RIP2, receptor-interacting protein kinase 2; TAB, TGF-β activated kinase; TAK1, targets transforming growth factor-β-activated kinase 1; UPR, unfolded protein response. Autophagy represents a cellular stress response that plays key roles in physiological processes, such as innate and adaptive immunity, adaptation to starvation, degradation of misfolded or aggregated proteins or damaged organelles and elimination of intracellular pathogens, in order to promote cellular survival. The role of NOD1 and NOD2 in autophagy is a recent discovery and still under debate. Notably, CD-associated NOD2 variants are defective in ATG16L1 recruitment and exhibit an altered autophagy in a cell type-specific manner.91 Furthermore, in patients with ileal CD, mutations in autophagy genes other than in NOD2 lead to an impaired secretion of Paneth cell-derived α-defensins with a deficiency in clearance of internalized bacteria.119–122 Therefore, the combination of defective innate immune responses by NOD2 and ineffective bacterial clearance by autophagy could together be responsible for CD development and progression. The involvement of NOD2 in the pathogenesis of several genetic diseases indicates that this protein is a key regulator of immune and inflammatory responses. Extensive studies have evidenced a fundamental role of NOD2 in maintaining the equilibrium between bacteria, epithelia and innate immune response of the host. This protective function is lost in case of NOD2 mutations, resulting in exacerbated inflammation and the onset of various diseases. On the other hand, inappropriate activation of WT NOD2 is reported in many chronic inflammatory diseases, resulting in continuous production of proinflammatory mediators, but the exact mechanism underlying this NOD2 dysregulation is not yet well established. Recent literature has shifted the interest from genetic to epigenetic control and to interactions with other innate immune pathways such as autophagy and ER stress. Many questions remain unanswered, including the relation between NOD2 mutations and microbiota and the understanding of the processes by which mutations in the NOD2 could be associated with the susceptibility to inflammation and development of diseases. When the exact mechanism of regulation and functions of NOD2 will be unraveled, it could lead to the development of more effective therapies for inflammatory disorders. Takeuchi O, Akira S. Pattern recognition receptors and inflammation. Cell. 2010;140(6):805–20. Proell M, Riedl SJ, Fritz JH, Rojas AM, Schwarzenbacher R. The Nod-like receptor (NLR) family: a tale of similarities and differences. PLoS One. 2008;3(4):e2119. Feerick CL, McKernan DP. Understanding the regulation of pattern recognition receptors in inflammatory diseases – a ‘Nod’ in the right direction. Immunology. 2017;150(3):237–247. Philpott DJ, Sorbara MT, Robertson SJ, Croitoru K, Girardin SE. 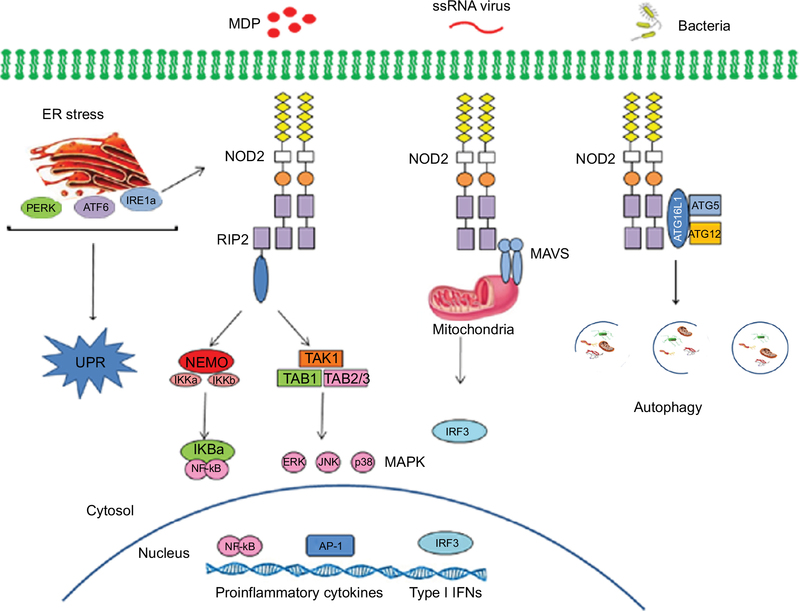 NOD proteins: regulators of inflammation in health and disease. Nat Rev Immunol. 2014;14(1):9–23. Hugot JP, Chamaillard M, Zouali H, et al. Association of NOD2 leucine rich repeat variants with susceptibility to Crohn’s disease. Nature. 2001;411(6837):599–603. Ogura Y, Bonen DK, Inohara N, et al. A frameshift mutation in NOD2 associated with susceptibility to Crohn’s disease. Nature. 2001;411(6837):603–606. Dugan J, Griffiths E, Snow P et al. Blau syndrome-associated Nod2 mutation alters expression of full length NOD2 and limits responses to muramyl dipeptide in knock-in mice. J Immunol. 2015;194(1):349–357. Kanazawa N, Okafuji I, Kambe N, et al. Early-onset sarcoidosis and CARD15 mutations with constitutive nuclear factor-kappaB activation: common genetic etiology with Blau syndrome. Blood. 2005;105(3):1195–1197. Tattoli I, Carneiro LA, Jéhanno M, et al. NLRX1 is a mitochondrial NOD-like receptor that amplifies NF-kappaB and JNK pathways by inducing reactive oxygen species production. EMBO Rep. 2008;9(3):293–300. Moore CB, Bergstralh DT, Duncan JA et al. NLRX1 is a regulator of mitochondrial antiviral immunity. Nature. 2008;451(7178):573–577. Boyle JP, Parkhouse R, Monie TP. Insights into the molecular basis of the NOD2 signalling pathway. Open Biol. 2014;4(12):140178. Sidiq T, Yoshihama S, Downs I, Kobayashi KS. Nod2: a critical regulator of ileal microbiota and Crohn’s disease. Front Immunol. 2016;7:367. eCollection 2016. Nigro G, Rossi R, Commere PH, Jay P, Sansonetti PJ. The cytosolic bacterial peptidoglycan sensor Nod2 affords stem cell protection and links microbes to gut epithelial regeneration. Cell Host Microbe. 2014;15(6):792–798. Philpott DJ, Girardin SE. Nod-like receptors: sentinels at host membranes. Curr Opin Immunol. 2010;22(4):428–434. Hofmann K, Bucher P, Tschopp J. The CARD domain: a new apoptotic signaling motif. Trends Biochem Sci. 1997;22(5):155–166. Girardin SE, Boneca IG, Viala J, et al. Nod2 is a general sensor of peptidoglycan through muramyl dipeptide (MDP) detection. J Biol Chem. 2003;278(11):8869–8872. Kobayashi KS, Chamaillard M, Ogura Y, et al. Nod2-dependent regulation of innate and adaptive immunity in the intestinal tract. Science. 2005;307(5710):731–734. Park JH, Kim YG, McDonald C, et al. RICK/RIP2 mediates innate immune responses induced through Nod1 and Nod2 but not TLRs. J Immunol. 2007;178(4):2380–2386. Rahighi S, Ikeda F, Kawasaki M, et al. Specific recognition of linear ubiquitin chains by NEMO is important for NF-kappaB activation. Cell. 2009;136(6):1098–1109. Jiang X, Chen ZJ. The role of ubiquitylation in immune defence and pathogen evasion. Nat Rev Immunol. 2011;12(1):35–48. Karin M. The Regulation of AP-1 Activity by Mitogen-activated Protein Kinases. J Biol Chem. 1995;270(28):16483–16486. Hsu LC, Ali SR, McGillivray S, et al. A NOD2-NALP1 complex mediates caspase-1-dependent IL-1beta secretion in response to Bacillus anthracis infection and muramyl dipeptide. Proc Natl Acad Sci U S A. 2008;105(22):7803–7808. Meinzer U, Barreau F, Esmiol-Welterlin S, et al. Yersinia pseudotuberculosis effector YopJ subverts the Nod2/RICK/TAK1 pathway and activates caspase-1 to induce intestinal barrier dysfunction. Cell Host Microbe. 2012;11(4):337–351. Travassos LH, Carneiro LA, Ramjeet M, et al. Nod1 and Nod2 direct autophagy by recruiting ATG16L1 to the plasma membrane at the site of bacterial entry. Nat. Immunol. 2010;11(1):55–62. Warner N, Burberry A, Franchi L, et al. A genome-wide siRNA screen reveals positive and negative regulators of the NOD2 and NF-κB signaling pathways. Sci Signal. 2013;6(258):rs3. Richmond AL, Kabi A, Homer CR, et al. The nucleotide synthesis enzyme CAD inhibits NOD2 antibacterial function in human intestinal epithelial cells. Gastroenterology. 2012;142(7):1483–1492. Lecat A, Di Valentin E, Somja J, et al. The c-Jun N-terminal kinase (JNK)-binding protein (JNKBP1) acts as a negative regulator of NOD2 protein signaling by inhibiting its oligomerization process. J Biol Chem. 2012;287(35):29213–29226. Lipinski S, Grabe N, Jacobs G, et al. RNAi screening identifies mediators of NOD2 signaling: implications for spatial specificity of MDP recognition. Proc Natl Acad Sci USA. 2012;109(52):21426–21431. Lee KH, Biswas A, Liu YJ, Kobayashi KS. Proteasomal degradation of Nod2 protein mediates tolerance to bacterial cell wall components. J Biol Chem. 2012;287(47):39800–39811. Watanabe T, Asano N, Meng G, et al. NOD2 downregulates colonic inflammation by IRF4-mediated inhibition of K63-linked polyubiquitination of RICK and TRAF6. Mucosal Immunol. 2014;7(6):1312–1325. Mohanan V, Grimes CL. The molecular chaperone HSP70 binds to and stabilizes NOD2, an important protein involved in Crohn disease. J Biol Chem. 2014;289(27):18987–18998. Tigno-Aranjuez JT, Abbott DW. Ubiquitination and phosphorylation in the regulation of NOD2 signaling and NOD2-mediated disease. Biochim Biophys Acta. 2012;1823(11):2022–2028. Yang S, Wang B, Humphries F, et al. Pellino3 ubiquitinates RIP2 and mediates Nod2-induced signaling and protective effects in colitis. Nat Immunol. 2013;14(9):927–936. Damgaard RB, Nachbur U, Yabal M, et al. The ubiquitin ligase XIAP recruits LUBAC for NOD2 signaling in inflammation and innate immunity. Mol Cell. 2012;46(6):746–758. Chirieleison SM, Marsh RA, Kumar P, Rathkey JK, Dubyak GR, Abbott DW. Nucleotide-binding oligomerization domain (NOD) signaling defects and cell death susceptibility cannot be uncoupled in X-linked inhibitor of apoptosis (XIAP)-driven inflammatory disease. J Biol Chem. 2017;292(23):9666–9679. Zurek B, Schoultz I, Neerincx A, et al. TRIM27 negatively regulates NOD2 by ubiquitination and proteasomal degradation. PLoS One. 2012;7(7):e41255. Bist P, Cheong WS, Ng A, et al. E3 Ubiquitin ligase ZNRF4 negatively regulates NOD2 signalling and induces tolerance to MDP. Nat Commun. 2017;8:15865. Fiil BK, Damgaard RB, Wagner SA, et al. OTULIN restricts Met1-linked ubiquitination to control innate immune signaling. Mol Cell. 2013;50(6):818–830. Yan R, Liu Z. LRRK2 enhances Nod1/2-mediated inflammatory cytokine production by promoting Rip2 phosphorylation. Protein Cell. 2017;8(1):55–66. Stevens C, Henderson P, Nimmo ER, et al. The intermediate filament protein, vimentin, is a regulator of NOD2 activity. Gut. 2013;62(5), 695–707. Pierdomenico M, Cesi V, Cucchiara S, et al. NOD2 is regulated by Mir-320 in physiological conditions but this control is altered in inflamed tissues of patients with inflammatory bowel disease. Inflamm Bowel Dis. 2016;22(2):315–326. Chuang AY, Chuang JC, Zhai Z, Wu F, Kwon JH. NOD2 expression is regulated by microRNAs in colonic epithelial HCT116 cells. Inflamm Bowel Dis. 2014;20(1):126–35. Strober W, Asano N, Fuss I, Kitani A, Watanabe T. Cellular and molecular mechanisms underlying NOD2 risk-associated polymorphisms in Crohn’s disease. Immunol Rev. 2014;260(1):249–260. Miceli-Richard C, Lesage S, Rybojad M, et al. CARD15 mutations in Blau syndrome. Nat Genet. 2001;29(1):19–20. Yao Q. Nucleotide-binding oligomerization domain containing 2: structure, function, and diseases. Semin Arthritis Rheum. 2013;43(1):125–130. Caso F, Galozzi P, Costa L, Sfriso P, Cantarini L, Punzi L. Autoinflammatory granulomatous diseases: from Blau syndrome and early-onset sarcoidosis to NOD2-mediated disease and Crohn’s disease. RMD Open. 2015;1(1):e000097. Blander JM, Longman RS, Iliev ID, Sonnenberg GF, Artis D. Regulation of inflammation by microbiota interactions with the host. Nat Immunol. 2017;18(8):851–860. Balasubramanian I, Gao N. From sensing to shaping microbiota: insights into the role of NOD2 in intestinal homeostasis and progression of Crohn’s disease. Am J Physiol Gastrointest Liver Physiol. 2017;313(1):G7–G13. Rehman A, Sina C, Gavrilova O, et al. Nod2 is essential for temporal development of intestinal microbial communities. Gut. 2011;60(10):1354–1362. Al Nabhani Z, Dietrich G, Hugot JP, Barreau F. Nod2: the intestinal gate keeper. PLoS Pathog. 2017;13(3):e1006177. Biswas A, Petnicki-Ocwieja T, Kobayashi KS. Nod2: a key regulator linking microbiota to intestinal mucosal immunity. J Mol Med (Berl). 2012;90(1):15–24. Jiang W, Wang X, Zeng B, et al. Recognition of gut microbiota by NOD2 is essential for the homeostasis of intestinal intraepithelial lymphocytes. J Exp Med. 2013;210(11):2465–2476. Couturier-Maillard A, Secher T, Rehman A, et al. NOD2-mediated dysbiosis predisposes mice to transmissible colitis and colorectal cancer. J Clin Invest. 2013;123(2):700–711. Ogura Y, Lala S, Xin W, et al. Expression of NOD2 in Paneth cells: a possible link to Crohn’s ileitis. Gut. 2003;52(11):1591–1597. Petnicki-Ocwieja T, Hrncir T, Liu YJ, et al. Nod2 is required for the regulation of commensal microbiota in the intestine. Proc Natl Acad Sci USA. 2009;106(37):15813–15818. Robertson SJ, Zhou JY, Geddes K, et al. Nod1 and Nod2 signaling does not alter the composition of intestinal bacterial communities at homeostasis. Gut Microbes. 2013;4(3):222–231. Robertson SJ, Geddes K, Maisonneuve C, Streutker CJ, Philpott DJ. Resilience of the intestinal microbiota following pathogenic bacterial infection is independent of innate immunity mediated by NOD1 or NOD2. Microbes Infect. 2016;18(7–8):460–471. Shanahan MT, Carroll IM, Grossniklaus E, et al. Mouse Paneth cell antimicrobial function is independent of Nod2. Gut. 2014;63(6):903–910. Bereswill S, Grundmann U, Alutis ME, Fischer A, Heimesaat MM. Campylobacter jejuni infection of conventionally colonized mice lacking nucleotide-oligomerization-domain-2. Gut Pathog. 2017;9:5. Caruso R, Warner N, Inohara N, Núñez G. NOD1 and NOD2: signaling, host defense, and inflammatory disease. Immunity. 2014;41(6):898–908. Hruz P, Zinkernagelb AS, Jenikovaa G, et al. NOD2 contributes to cutaneous defense against Staphylococcus aureus through α-toxin-dependent innate immune activation. Proc Natl Acad Sci USA. 2009;106(31):12873–12878. Kim YG, Kamada N, Shaw MH, et al. The NOD2 sensor promotes intestinal pathogen eradication via the chemokine CCL2-dependent recruitment of inflammatory monocytes. Immunity. 2011;34(5):769–780. Geddes K, Rubino S, Streutker C, et al. NOD1 and NOD2 regulation of inflammation in the salmonella colitis model. Infect. Immun. 2010;78(12):5107–5115. Geddes K, Rubino SJ, Magalhaes JG, et al. Identification of an innate T helper type 17 response to intestinal bacterial pathogens. Nat Med. 2011;17(7):837–844. Lecat,A, Piette J, Legrand-Poels S. The protein Nod2: an innate receptor more complex than previously assumed. Biochem Pharmacol. 2010;80(12):2021–2031. Subramanian K, Bergman P, Henriques-Normark B. Vitamin D promotes pneumococcal killing and modulates inflammatory responses in primary human neutrophils. J Innate Immun. 2017;9(4):375–386. Liu J, Xiang J, Li X, et al. NF-κΒ activation is critical for bacterial lipoprotein tolerance-enhanced bactericidal activity in macrophages during microbial infection. Sci Rep. 2017;7:40418. Lipinski S, Till A, Sina C, et al. DUOX2-derived reactive oxygen species are effectors of NOD2-mediated antibacterial responses. Cell Sci. 2009;122(Pt 19):3522–3530. Beynon V, Cotofana S, Brand S, et al. NOD2/CARD15 genotype influences MDP-induced cytokine release and basal IL-12p40 levels in primary isolated peripheral blood monocytes. Inflamm Bowel Dis. 2008;14(8):1033–1040. Fritz JH, Girardin SE, Fitting C, et al. Synergistic stimulation of human monocytes and dendritic cells by Toll-like receptor 4 and NOD1- and NOD2-activating agonists. Eur J Immunol. 2005;35(8):2459–2470. Coulombe F, Fiola S, Akira S, Cormier Y, Gosselin J. Muramyl dipeptide induces NOD2-dependent Ly6Chigh monocyte recruitment to the lungs and protects against influenza virus infection. PLoS One. 2012;7(5):e36734. Kapoor A, Fan YH, Arav-Boger R. Bacterial muramyl dipeptide (MDP) restricts human cytomegalovirus replication via an IFN-β-dependent pathway. Sci Rep. 2016;6:20295. Sabbah A, Chang TH, Harnack R, et al. Activation of innate immune antiviral responses by Nod2. Nat. Immunol. 2009;10(10):1073–1080. Bansal K, Balaji KN. Intracellular pathogen sensor NOD2 programs macrophages to trigger Notch1 activation. J Biol Chem. 2011;286(7):5823–5835. Magalhaes JG, Rubino SJ, Travassos LH, et al. Nucleotide oligomerization domain-containing proteins instruct T cell helper type 2 immunity through stromal activation. Proc Natl Acad Sci U S A. 2011;108(36):14896–14901. Tada H, Aiba S, Shibata K, Ohteki T, Takada H. Synergistic effect of Nod1 and Nod2 agonists with toll-like receptor agonists on human dendritic cells to generate interleukin-12 and T helper type 1 cells. Infect Immun. 2005;73(12):7967–7976. Jeong YJ, Kang MJ, Lee SJ, et al. Nod2 and Rip2 contribute to innate immune responses in mouse neutrophils. Immunology. 2014;143(2):269–276. Brain O, Owens BM, Pichulik T, et al. The intracellular sensor NOD2 induces microRNA-29 expression in human dendritic cells to limit IL-23 release. Immunity. 2013;39(3):521–536. Van Beelen AJ, Zelinkova Z, Taanman-Kueter EW, et al. Stimulation of the intracellular bacterial sensor NOD2 programs dendritic cells to promote interleukin-17 production in human memory T Cells. Immunity. 2007;27(4):660–669. Kawai T, Akira S. Innate immune recognition of viral infection. Nat Immunol. 2006;7(2):131–137. Keestra-Gounder AM, Tsolis RM. NOD1 and NOD2: beyond peptidoglycan sensing. Trends Immunol. 2017;38(10):758–767. Kapoor A, Forman M, Arav-Boger R. Activation of nucleotide oligomerization domain 2 (NOD2) by human cytomegalovirus initiates innate immune responses and restricts virus replication. PLoS One. 2014;9(3):e92704. Jones M, Cunningham ME, Wing P, et al. SB 9200, a novel agonist of innate immunity, shows potent antiviral activity against resistant HCV variants. J Med Virol. 2017;89(9):1620–1628. Wathelet MG, Lin CH, Parekh BS, Ronco LV, Howley PM, Maniatis T. Virus infection induces the assembly of coordinately activated transcription factors on the IFN-beta enhancer in vivo. Mol Cell. 1998;1(4):507–518. Dugan JW, Albor A, David L, et al. Nucleotide oligomerization domain-2 interacts with 2′-5′-oligoadenylate synthetase type 2 and enhances RNase-L function in THP-1 cells. Mol Immunol. 2009;47(2–3):560–566. Sorbara MT, Ellison LK, Ramjeet M, et al. The protein ATG16L1 suppresses inflammatory cytokines induced by the intracellular sensors Nod1 and Nod2 in an autophagy-independent manner. Immunity. 2013;39(5):858–873. Negroni A, Colantoni E, Vitali R, et al. NOD2 induces autophagy to control AIEC bacteria infectiveness in intestinal epithelial cells. Inflamm Res. 2016;65(10):803–813. Müzes G, Tulassay Z, Sipos F. Interplay of autophagy and innate immunity in Crohn’s disease: a key immunobiologic feature. World J Gastroenterol. 2013;19(28):4447–4454. Homer CR, Richmond AL, Rebert NA, Achkar JP, McDonald C. ATG16L1 and NOD2 interact in an autophagy-dependent antibacterial pathway implicated in Crohn’s disease pathogenesis. Gastroenterology. 2010;139(5):1630–1641. Cadwell K. Crohn’s disease susceptibility gene interactions, a NOD to the newcomer ATG16L1. Gastroenterology. 2010;139(5):1448–1450. Salem M, Ammitzboell M, Nys K, Seidelin JB, Nielsen OH. ATG16L1: a multifunctional susceptibility factor in Crohn disease. Autophagy. 2015;11(4):585–594. Nguyen HT, Lapaquette P, Bringer MA, Darfeuille-Michaud A. Autophagy and Crohn’s disease. J Innate Immun. 2013;5(5):434–443. Cooney R, Baker J, Brain O, et al. NOD2 stimulation induces autophagy in dendritic cells influencing bacterial handling and antigen presentation. Nat Med. 2010;16(1):90–97. Anand PK, Tait SW, Lamkanfi M, et al. TLR2 and RIP2 pathways mediate autophagy of Listeria monocytogenes via extracellular signal-regulated kinase (ERK) activation. J Biol Chem. 2011;286(50):42981–42991. Homer CR, Kabi A, Marina-García N, et al. A dual role for receptor-interacting protein kinase 2 (RIP2) kinase activity in nucleotide-binding oligomerization domain 2 (NOD2)-dependent autophagy. J Biol Chem. 2012;287(30):25565–25576. Byndloss MX, Keestra-Gounder AM, Bäumler AJ, Tsolis RM. NOD1 and NOD2: new functions linking endoplasmic reticulum stress and inflammation. DNA Cell Biol. 2016;35(7):311–313. Keestra-Gounder AM, Byndloss MX, Seyffert N, et al. NOD1 and NOD2 signalling links ER stress with inflammation. Nature. 2016;532(7599):394–397. Caruso R, Núñez G. Innate immunity: ER stress recruits NOD1 and NOD2 for delivery of inflammation. Curr Biol. 2016;26(12):R508–R511. Kaser A, Blumberg RS. Endoplasmic reticulum stress and intestinal inflammation. Mucosal Immunol. 2010;3(1):11–16. Hosomi S, Kaser A, Blumberg RS. Role of endoplasmic reticulum stress and autophagy as interlinking pathways in the pathogenesis of inflammatory bowel disease. Curr Opin Gastroenterol. 2015;31(1):81–88. Adolph TE, Tomczak MF, Niederreiter L, et al. Paneth cells as a site of origin for intestinal inflammation. Nature. 2013;503(7475):272–276. Fritz T, Niederreiter L, Adolph T, Blumberg RS, Kaser A. Crohn’s disease: NOD2, autophagy and ER stress converge. Gut. 2011;60(11):1580–1588. Hoefkens E, Nys K, John JM, et al. Genetic association and functional role of Crohn disease risk alleles involved in microbial sensing, autophagy, and endoplasmic reticulum (ER) stress. Autophagy. 2013;9(12):2046–2055. Kaser A, Lee AH, Franke A, et al. XBP1 links ER stress to intestinal inflammation and confers genetic risk for human inflammatory bowel disease. Cell. 2008;134(5):743–756. Montane J, Cadavez L, Novials A. Stress and the inflammatory process: a major cause of pancreatic cell death in type 2 diabetes. Diabetes Metab Syndr Obes. 2014;7:25–34. Kim DH, Cheon JH. Pathogenesis of inflammatory bowel disease and recent advances in biologic therapies. Immune Netw. 2017;17(1):25–40. Jostins L, Ripke S, Weersma RK, et al. Host-microbe interactions have shaped the genetic architecture of inflammatory bowel disease. Nature. 2012;491(7422):119–24. Kim YG, Shaw MH, Warner N, et al. Cutting edge: Crohn’s disease-associated Nod2 mutation limits production of proinflammatory cytokines to protect the host from Enterococcus faecalis induced lethality. J Immunol. 2011;187(6):2849–2852. Salem M, Seidelin JB, Eickhardt S, Alhede M, Rogler G, Nielsen OH. Species-specific engagement of human nucleotide oligomerization domain 2 (NOD)2 and Toll-like receptor (TLR) signalling upon intracellular bacterial infection: role of Crohn’s associated NOD2 gene variants. Clin Exp Immunol. 2015;179(3):426–434. Hugot JP, Zaccaria I, Cavanaugh J, et al; IBD International Genetics Consortium. Prevalence of CARD15/NOD2 mutations in Caucasian healthy people. Am J Gastroenterol. 2007;102(6):1259–1267. Pauleau AL, Murray PJ. Role of nod2 in the response of macrophages to toll-like receptor agonists. Mol Cell Biol. 2003;23(21):7531–7539. Amendola A, Butera A, Sanchez M, Strober W, Boirivant M. Nod2 deficiency is associated with an increased mucosal immune regulatory response to commensal microorganisms. Mucosal Immunol. 2014;7(2):391–404. Lesage S, Zouali H, Cézard JP, et al. CARD15/NOD2 mutational analysis and genotype-phenotype correlation in 612 patients with inflammatory bowel disease. Am J Hum Genet. 2002;70(4):845–857. Hampe J, Grebe J, Nikolaus S, et al. Association of NOD2 (CARD 15) genotype with clinical course of Crohn’s disease: a cohort study. Lancet. 2002;359(9318):1661–1665. Wehkamp J, Harder J, Weichenthal M, et al. NOD2 (CARD15) mutations in Crohn’s disease are associated with diminished mucosal a-defensin expression. Gut. 2004;53(11):1658–1664. Wehkamp J, Salzman NH, Porter E, et al. Reduced Paneth cell a-defensins in ileal Crohn’s disease. Proc Natl Acad Sci U S A. 2005;102(50):18129–18134. Simms LA, Doecke JD, Walsh MD, Huang N, Fowler EV, Radford-Smith GL. Reduced a-defensin expression is associated with inflammation and not NOD2 mutation status in ileal Crohn’s disease. Gut. 2008;57(7):903–110. Cadwell K, Liu JY, Brown SL, et al. A key role for autophagy and the autophagy gene Atg16l1 in mouse and human intestinal Paneth cells. Nature. 2008;456(7219):259–263. Wolfkamp SC, Verseyden C, Vogels EW, et al. ATG16L1 and NOD2 polymorphisms enhance phagocytosis in monocytes of Crohn’s disease patients. World J Gastroenterol. 2014;20(10):2664–2672. Tromp G, Kuivaniemi H, Raphael S, et al. Genetic linkage of familial granulomatous inflammatory arthritis, skin rash, and uveitis to chromosome 16. Am J Hum Genet. 1996;59(5):1097–1107. Blau EB. Familial granulomatous arthritis, iritis, and rash. J Pediatr. 1985;107(5):689–693. Wouters CH, Maes A, Foley KP, Bertin J, Rose CD. Blau syndrome, the prototypic auto-inflammatory granulomatous disease. Pediatr Rheumatol Online J. 2014;12:33. Hasler P. Gabay C. Rheumatoid arthritis: from basic findings and clinical manifestations to future therapies. Semin Immunopathol. 2017;39(4):339–341. Kim HW, Kwon YJ, Park BW, Song JJ, Park YB, Park MC. Differential expressions of NOD-like receptors and their associations with inflammatory responses in rheumatoid arthritis. Clin Exp Rheumatol. 2017;35(4):630–637. Yuan H, Zelkha S, Burkatovskaya M, Gupte R, Leeman SE, Amar S. Pivotal role of NOD2 in inflammatory processes affecting atherosclerosis and periodontal bone loss. Proc Natl Acad Sci U S A. 2013;110(52):E5059–E5068. Liu HQ, Zhang XY, Edfeldt K, et al. NOD2-mediated innate immune signaling regulates the eicosanoids in atherosclerosis. Arterioscler Thromb Vasc Biol. 2013;33(9):2193–2201. Johansson ME, Zhang XY, Edfeldt K, et al. Innate immune receptor NOD2 promotes vascular inflammation and formation of lipid-rich necrotic cores in hypercholesterolemic mice, Eur J Immunol. 2014;44(10):3081–3092. Zeidan MJ, Saadoun D, Garrido M, Klatzmann D, Six A, Cacoub P. Behçet’s disease physiopathology: a contemporary review. Auto Immun Highlights. 2016;7(1):4. Hamzaoui K, Abid H, Berraies A, Ammar J, Hamzaoui A. NOD2 is highly expressed in Behcet disease with pulmonary manifestations. J Inflamm (Lond). 2012;9(1):3. Liu Y, Yang H, Liu LX, et al. NOD2 contributes to myocardial ischemia/reperfusion injury by regulating cardiomyocyte apoptosis and inflammation. Life Sci. 2016;149:10–17. Nagata E, Oho T. Invasive Streptococcus mutans induces inflammatory cytokine production in human aortic endothelial cells via regulation of intracellular toll-like receptor 2 and nucleotide-binding oligomerization domain 2. Mol Oral Microbiol. 2017;32(2):131–141. Yao Q, Su LC, Tomecki KJ, Zhou L, Jayakar B, Shen B. Dermatitis as a characteristic phenotype of a new autoinflammatory disease associated with NOD2 mutations. J Am Acad Dermatol. 2013;68(4):624–631. Macaluso F, Nothnagel M, Parwez Q, et al. Polymorphisms in NACHT-LRR (NLR) genes in atopic dermatitis. Exp Dermatol. 2007;16(8):692–698. Wong CK, Chu IM, Hon KL, Tsang MS, Lam CW. Aberrant expression of bacterial pattern recognition receptor NOD2 of basophils and microbicidal peptides in atopic dermatitis. Molecules. 2016;21(4):471. Jiao D, Wong CK, Qiu HN, et al. NOD2 and TLR2 ligands trigger the activation of basophils and eosinophils by interacting with dermal fibroblasts in atopic dermatitis-like skin inflammation. Cell Mol Immunol. 2016;13(4):535–550. Rodriguez-Nunez I, Caluag T, Kirby K, Rudick CN, Dziarski R, Gupta D. Nod2 and Nod2-regulated microbiota protect BALB/c mice from diet-induced obesity and metabolic dysfunction. Sci Rep. 2017;7(1):548. Denou, E. Lolmède K, Garidou L, et al. Defective NOD2 peptidoglycan sensing promotes diet-induced inflammation, dysbiosis, and insulin resistance. EMBO Mol Med. 2015;7(3):259–274. Prajapati B, Jena PK, Rajput P, Purandhar K, Seshadri S. Understanding and modulating the toll like receptors (TLRs) and NOD like receptors (NLRs) cross talk in type 2 diabetes. Curr Diabetes Rev. 2014;10(3):190–200. Deng B, Ye Z, Li L, et al. Higher expression of NOD1 and NOD2 is associated with Vogt-Koyanagi-Harada (VKH) Syndrome but not Behcet’s disease (BD). Curr Mol Med. 2016;16(4):424–435. Branquinho D, Freire P, Sofia C. NOD2 mutations and colorectal cancer – Where do we stand? World J Gastrointest Surg. 2016;8(4):284–293. Castaño-Rodríguez N, Kaakoush NO, Mitchell HM. Pattern-­recognition receptors and gastric cancer. Front Immunol. 2014;5:336. Kutikhin AG. 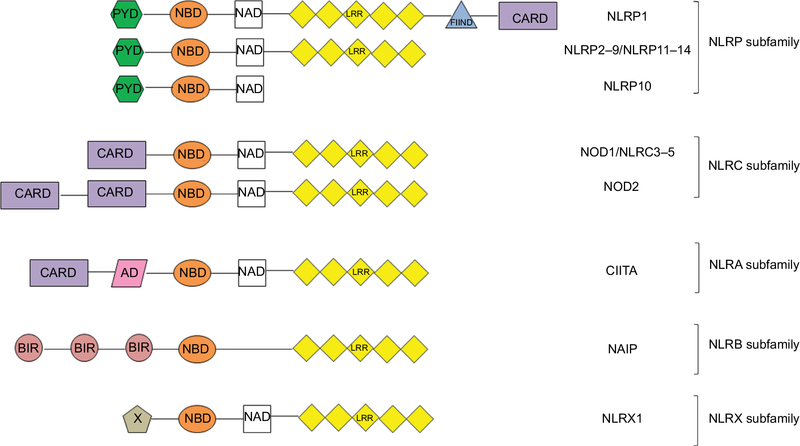 Role of NOD1/CARD4 and NOD2/CARD15 gene polymorphisms in cancer etiology. Hum Immunol. 2011;72(10):955–968. Liu J, He C, Xu Q, Xing C, Yuan Y. NOD2 polymorphisms associated with cancer risk: a meta-analysis. PLoS One. 2014;9(2):e89340.